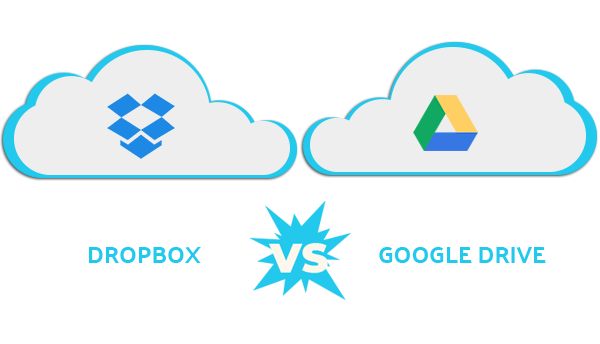 Which cloud storage service should you choose? Read our analysis to figure out which cloud service giant is right for you. Both Dropbox and Google Drive offer free storage. As you may already know, Dropbox offers 2 GB of cloud storage space and Google offers 15 GB. While Google seems to have the upper hand when it comes to free storage, we must not forget Dropbox referral program that lets users get 500MB of storage space every time they refer a friend or family member of theirs to Dropbox. Google’s free 15GB cloud storage is inclusive of other Google products like Gmail, Google Photos, etc. If you are using Gmail for a very long time, the chances are good that you might have consumed a good amount of space out of that free 15 GB. To sum up, Google Drive should be your preferred cloud partner, if you wish to remain a free user and are not willing to pay for a cloud storage service. The two cloud storage giants offer attractive plans for both consumers and business users. Dropbox has a pretty straightforward consumer pricing, which is set at $9.99/month (Dropbox Plus) and $19.99 (Dropbox Professional). Both plans offer the same storage space, which is 1 TB (1024 GB). Dropbox Professional users additionally enjoy access to some of the coolest Dropbox features like Smart Sync, showcase, full-text search, and file viewer history. Google Drive’s pricing starts from $1.99 a month and goes all the way up to $300. The cloud storage plans appeal to a large section of users. Unlike Dropbox, Google lets its customers choose a plan that is perfect for their storage needs. Google’s $1.99/Month (100 GB) is just right for someone who doesn’t need a lot of storage space. Users with high cloud storage needs can go with its 20 TB and 30 TB plans. Verdict: Google Drive has the edge over Dropbox concerning pricing. Dropbox has a sound file syncing feature that, at this moment, is unbeatable by any other cloud storage provider. Dropbox lets its users sync data on their laptops, desktops, and mobile phones. The best part of the Dropbox sync feature is that it supports multiple operating systems that range from Windows and Android to Linux. Dropbox’s highly sophisticated algorithms make file syncing a breeze. As the cloud storage giant proudly proclaims, nobody syncs like Dropbox! Google Drive falls a little short of Dropbox in this aspect as it doesn’t support Linux operating system natively. Verdict: if sync is all that matters to you, then Dropbox is the way to go. Google Drive, unquestionably, has an edge when it comes to collaboration, productivity, and application support. As you know, Google Drive works exceptionally well with some of its already popular products like Gmail, Google Photos, Google Docs, etc. thus making life simple for its users. Dropbox, on the other hand, needs to catch up to Google and Microsoft to retain its market dominance. Considering Dropbox’s history (Carousel and MailBox failures), it will indeed be a tough task for Dropbox to position its collaboration tool, Paper, as the best on the market. To summarize, Google is the undisputed king in this comparison, and there’s no reason why you should stick with Google Drive if productivity, not sync, is a critical feature to you. The conclusion is that there are no good clouds or bad clouds on the market. Every cloud storage provider has pros and cons. As a user, it’s your responsibility to study the features and pricing of cloud services well and select one that you think will be the right one for you. If you ever feel like you are stuck with a wrong cloud storage service, keep in mind that CloudFuze can move your data quickly and securely to a new cloud!